← Ogoola Karuta in English comes to Stellenbosch University in South Africa! 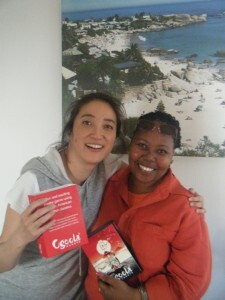 I met Ms.Tsehlana who loved my game and its concept in Capetown. We are dreaming of making a Rainbow version of Ogoola Karuta. A South African version that should contribute to peace and better understanding among the people of South Africa. Ms. Tsehlana comes from Lesotho, which is independent of SA but surrounded by South Africa. Learning about her culture and country has been a most interesting journey. I am really looking forward to getting to know the poets and poems of South Africa. Det här inlägget postades i Ogoola diary, Ogoola Karuta Poetry Game/ Ogoola Karuta Diktspel. Bokmärk permalänken.